Skinny Nadia is Happy at last! I want to start this by saying that Rescue is definitely an important aspect of saving so many dogs on general, and that there are so many out there that need good, loving homes. I have had a strong love for the German Shepherd since I was a little girl and knew that as an adult that would be the breed for me. A year an a half ago I had to let my sweet German Shepherd mix go to the Bridge. She had severe hip dysplasia and severe arthritis. I let her go to end her suffering. Soon after, my life had a void that could be filled no other way than to have another German Shepherd. 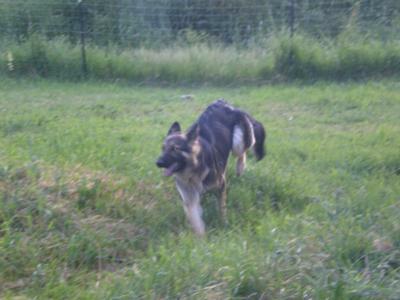 I contacted several local German Shepherd Rescues, however at the time did not have a fenced yard so could not qualify. Then I found a very handsome pair of Long Coat GSD's on CraigsList. I went to meet them, feel in love and came home with Zisso. He has been with me now for over a year and he definitely has me wrapped around his paw! Zisso was 16 months old when I brought him home, and little to no training, and a few mats in his long coat, but otherwise was in good condition. Somehow I felt that this was not enough and I began looking for just one more. I belong to a forum that is dedicated to the German Shepherd Dog, and when looking at the rescue pages there and was often taken to PetFinder.com. That is where I found Nadia. She was just 16 months old! As it turned out, she was 3.5 months younger than Zisso!! Nadia was with a Rescue locally so I went to meet her. She was underweight, but seemed calm and was very pleasant. After meeting her and visiting for an hour she was on her way home with me! The Rescue did not take an application from me, did not check my vet or personal references, and did not do a home check. While I know better now, I was thrilled at the time to have yet another German Shepherd. are good. I just want it to be known that I do know this, and fully expected it from the rescue that I got Nadia from. After bringing her home, I soon realized that Nadia had some problems, as a lot of rescue dogs do. One of hers was severe separation anxiety. So I faced it head on, and found what works for us. I used a voice activated tape recorder to monitor her reactions to my absence and worked thru the problem. Also she was not crate trained, altho I had been told she was. We got thru that too. Nadia had been an outside dog all her life. So another problem she had at first was going potty(#1 & #2) in the house. So with time and patience, we worked thru this as well. When I took Nadia to the vet the day after I got her, she sat crooked on the scale and I didn't see that, so her weight at the time is uncertain, but I estimate it to have been around 47 pounds. She is now a well adjusted, happy, healthy, 75 pound girl. The best thing about getting these two clowns of mine is all the fun things we do together! As I posted in an earlier photo, we go to the river, where they can romp and play. Nadia was the first to show she can swim and I was on cloud 9!! The weekend before Memorial Day weekend I got together with a friend and we took his black lab and my two GSD's and went to Morton, WA where they got to play in Alder Lake. Normally, my two do not get off leash time in public but we found a fantastic spot where they could go off leash, run, romp, play and swim. This is where Zisso showed his skills at swimming. I look forward to many more happy fun filled trips to locations where they can swim and have so much fun! I am attaching a photo of Nadia taken just a few days after she came to her furever home. You can see her spine protruding as she runs gleefully in her new yard. One thing I will say about this girl is that she Always always has a smile on her face!